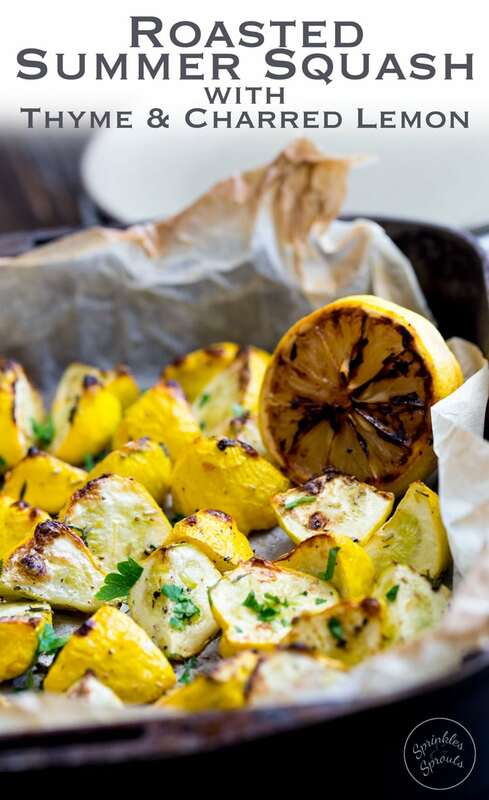 Flash roasted summer squash, drizzled with extra virgin olive oil and generously seasoned with fresh thyme. Finished with the caramelised sweet and sour hit of charred lemons. This is a side dish that packs a punch and is perfect for just about any occasion! I can’t help myself, I have an addiction! I am sorry but it is another roasted veg post!!! Is that about the millionth on the blog?!!?! Actually maybe not but I think this is number 12! Check them all out here!!! What can I say, veg just tastes better when roasted! It is sweet, smoky and oh so good! Here at Sprinkles and Sprouts I have written so many roasted veg roasts that I am actually struggling for things to say about this delicious roasted summer squash. I have waxed on about roasting veg so many times you are probably sick of it. I mean they are delicious, they take no effort and they are so much more interesting that plain steamed veg! So today I am sharing a new addiction with you!!! Charred lemons. OH MAN!!!!! I am using them in everything!!!! It all started because I had a bit of a lemon glut. So I chucked some on the griddle one night whilst I was making steak. Now I have said before how good steak is with a squeeze of lemon. Well, a squeeze of charred lemon. AMAZING!!!! When I wanted a little something extra for my fish burger I added charred lemons. AMAZING!!!!! 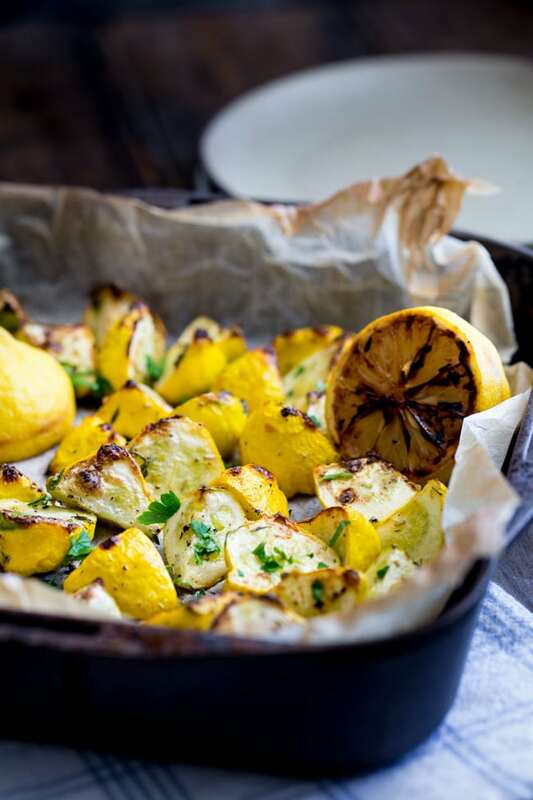 Then I added them to this sweet and fragrant roasted summer squash dish. AMAZING!!!! Safe to say “I was hooked!” . I went daredevil and made a twist on a G&T with roasted lemons and some coriander. Can you guess how good it was???? Shall I give you a clue? It begins with A and ends in MAZING!!! 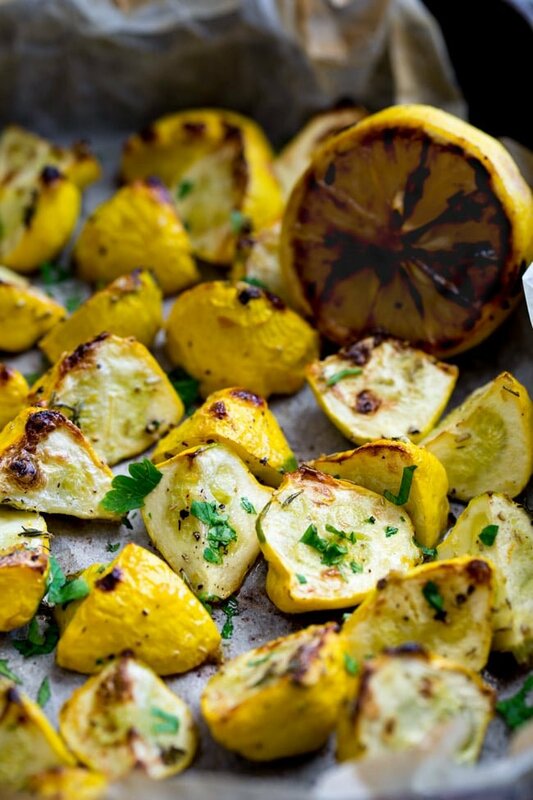 Anyway, now I have confessed my addictive food personality I can get back to these roasted summer squash. 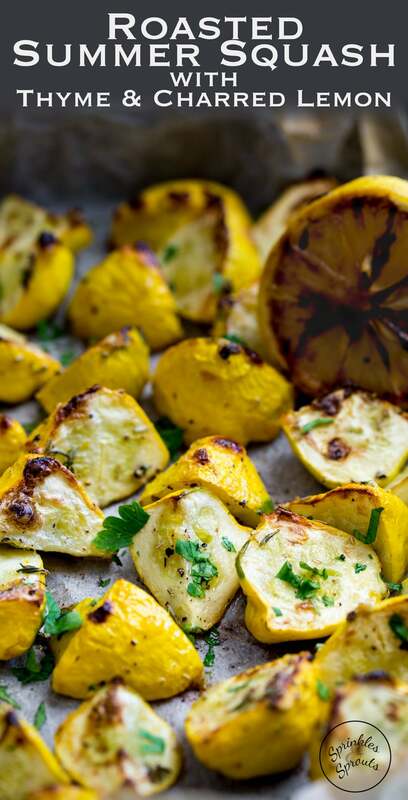 I used the super adorable, super cute and pretty much perfect looking patty pan squash (I think some people call them scallop squash) they work so well here. Cut into bite sized chunks, drizzled with extra virgin olive oil, plenty of salt and pepper and a scattering of lemon thyme (or normal thyme) then roasted hot and high. They are perfectly seasoning, deliciously charred and oh so good!!!! And lets not forget my fav of the moment, the charred lemon. Cut up and roasted along side the squash, it is a caramelised sweet and sour treat!! I promise you won’t be disappointed. These are, as my 6 year old would say. LEGENDARY! 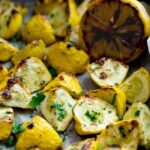 If you love this recipe for Roasted Summer Squash with Thyme and Charred Lemon why not pin it for later. 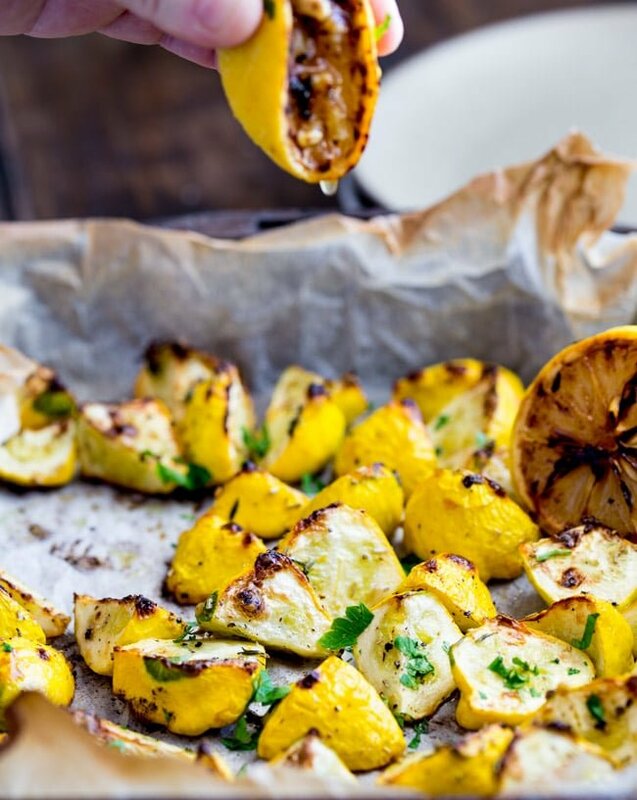 Drizzle the squash with the EVOO. 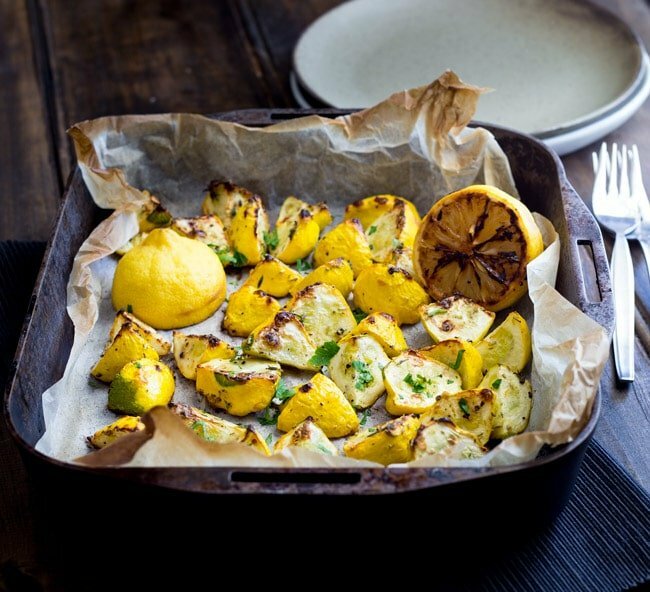 Add the salt, pepper, fresh thyme leaves and zest of the lemon to the squash and mix well to ensure everything is coated. Cut the lemon in half and nestle it amongst the squash. Roast for 20 minutes at the top of the oven, until the squash has some charred edges and the lemon is all jammy and caramelised. 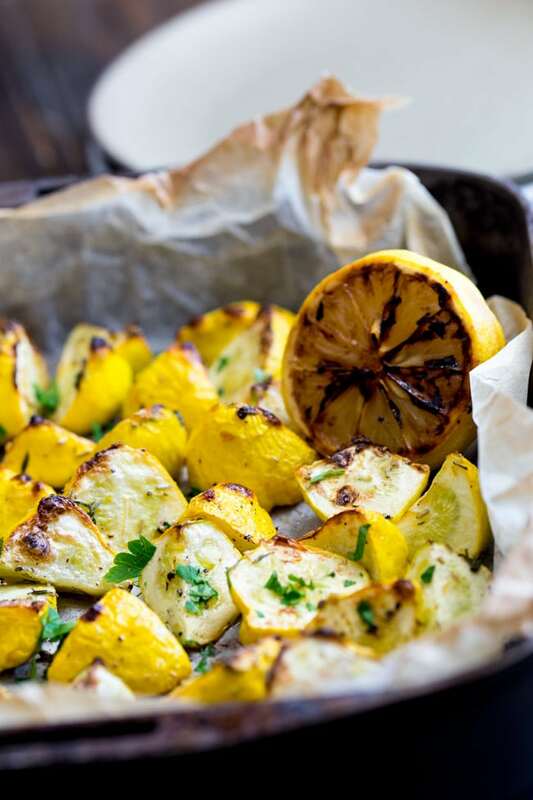 If you love food why not subscribe to my newsletter, I will drop you an email every now and then, just to say hi and send you a couple of recipes think you might love, like this Roasted Summer Squash with Thyme and Charred Lemon. This is a great recipe, and it’s summer squash season in Idaho. Can I please share this recipe on our Boise Co-op recipes page? I’ll provide a link to your home page from our web site. I love linking up with people who love great produce, so feel free to link to my page. Hi Claire. You may have to tether the goat or fence the top of it’s enclosure once you plant your garden, a fence won’t keep it out; goats are notorious escape and break in artists. Squash will climb a fence if guided which makes harvesting them easier. We plant ours close to the back fence which works great, plus they don’t lay on the ground so there is less chance of rot. Do make some squash pickles, they are good. I hear you with that!!! Our goat likes to come into the house!!!! I have found it before now in the boys playroom having a good look around!!! Hi Claire. 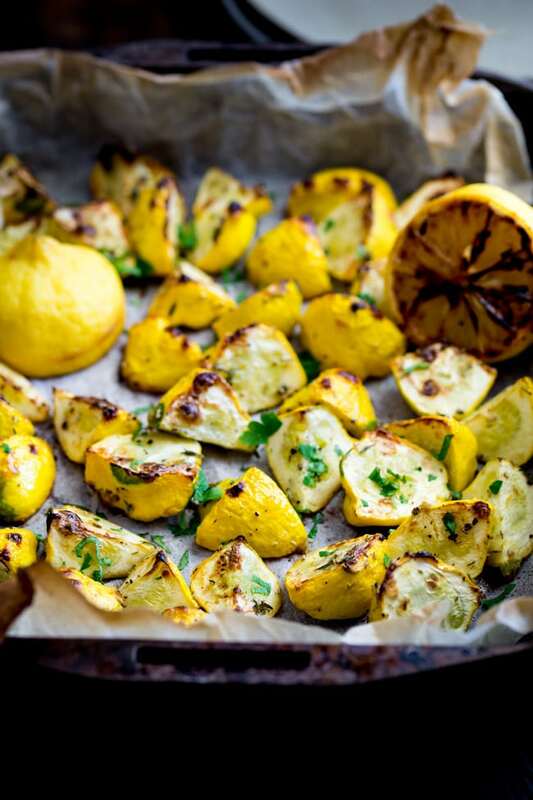 Here we call these patty pan squash. One year we grew some and let me tell you they are prolific and can double in size in a day. I had so many I started making refrigerator pickles out of them, jars and jars of them. Our best friend loves pickles and he decided he liked the squash pickles the best. Gary is coming around to roasted vegs, I’ve always loved them. OOOOH, I can’t wait to try growing them!!! I have finally got everything sorted to fence in an area so the goat doesn’t just eat all my crops!!! Just need to build it!